Build Your Own Arduino Synthezier! Happy new year, and we hope you all are enjoying this semester! 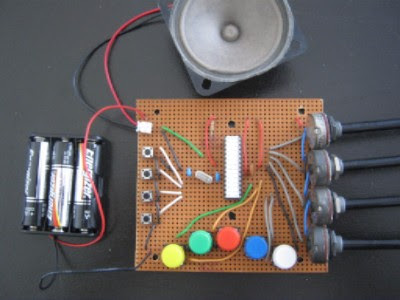 Come join us next Monday, and create your very own Arduino Synthesizer! This synthesizer generates professional-quality instrument tracks and sound effects. The process is quite simple, and we will provide everything you need to complete the project. All you need to bring is a laptop, and when you’re done you can even keep your project! Feel free to check out the instructions and videos of the synth in action at the bottom of the email! In this workshop we will be making 4 voice synthesizers which you will be able to take home with you. The synthesizers are built on the Arduino platform and require no programming experience to build. If you happen to have some simple coding knowledge, the synthesizers can be hacked to make any sound you can think up. The club will provide you with all the components necessary however Bring your laptop if you want to be able to modify the code. Click the blue button below for instructions as well as some clips of the Arduino synth in action!